What is Mongolian Barbecue? Originating in China's Shantung Provine, Mongolian Barbecue was adopted by Genghis Kahn of Mongolia in the 13th Century. Lore tells us the Kahn's soldiers would place meat and vegetables on top of their metal shields and cook over their campfires. The aroma would cause their enemies surrender without a fight. Using wood, natural gas or hot coals to heat the cast-iron grill, chefs have been creating delicious meals for centuries. 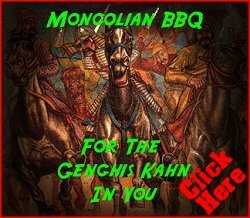 Smell the mouth-watering aroma of freshly grilled meat and vegetables and you will understand how this tasty dish helped Genghis Kahn conquer China. Combine all ingredients in resealable plastic bag and chill for 2 hours or more. Grill steak 6 to 7 minutes on each side, cook down your marinade until thinkened. Make wraps with lettuce leaves, add sliced beef and veggies, drizzel with sauce.